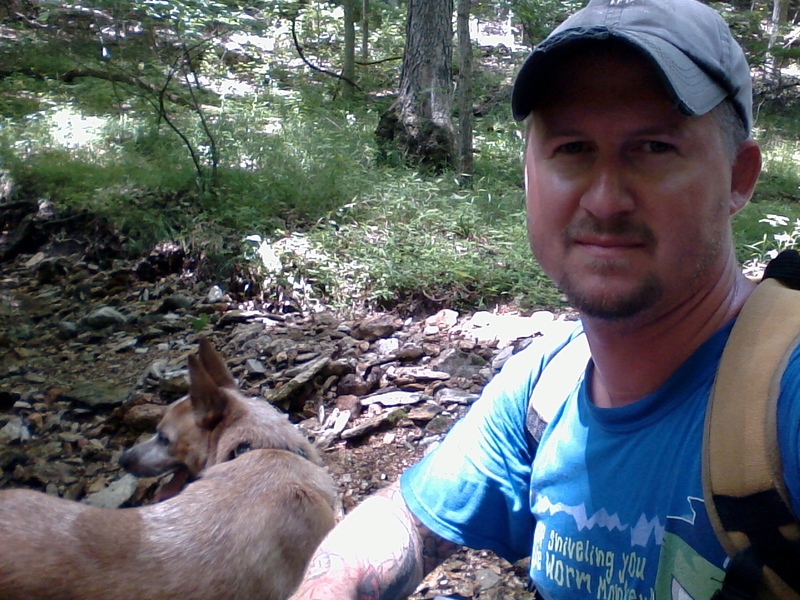 It had already been a pleasant day of hiking, as Max and I had already done a couple trails out at Greensfelder with some friends of ours. The total mileage to that point was probably just over 3 miles, and there was one more trail that I wanted to check out to finish with thorough satisfaction. So we said our goodbyes, drove to the other side of the park, ate our sandwich that we had brought for lunch, and headed down the Mustang Trail. From the interchange of Interstate 44 and 270, take 44 west for about 14 miles, to exit 261 (Allenton Road/Six Flags). Make a right onto Allenton Road, and follow it past Six Flags and into Greensfelder Park. Take it past the scenic park loop road, past the visitors center, and to the parking lot on the right that has the bathrooms, equestrian area, and campsite rules signs. At the far end of this parking lot, where the gravel drive empties back out onto Allenton Road, is the trailhead for the Mustang Trail. 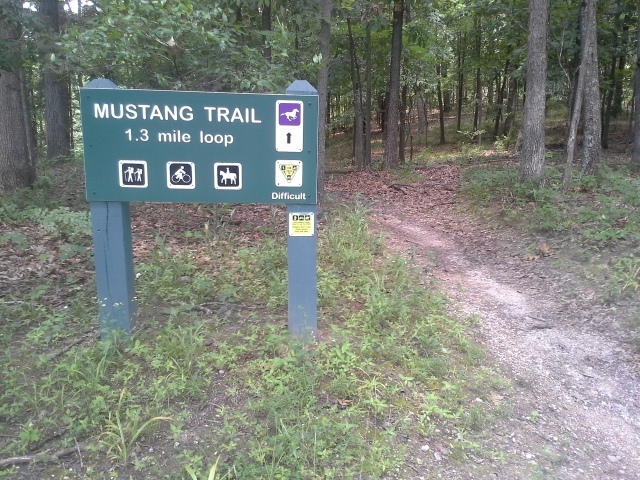 The Mustang Trail heads into the woods to the right, eventually arriving at fork. We chose to go left (clockwise) and very quickly headed down the hill and into the ravine. The trail takes a left and heads along the watershed on the right, eventually crossing it and making its way up the opposing hill to follow the road for a bit. 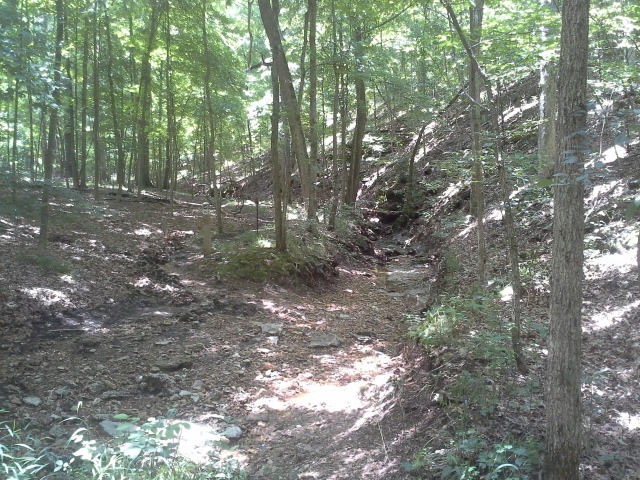 It flattens out for a little while, up at the top, and then turns to the right and goes sharply down another hill to the creek at the bottom. At this point you pass the connector on the left to the Eagle Valley Trail, and then you walk with the creek on your left for a bit. After some relatively flat trail along the side of the creek, you then start back up the hill to the fork, and out to the car. 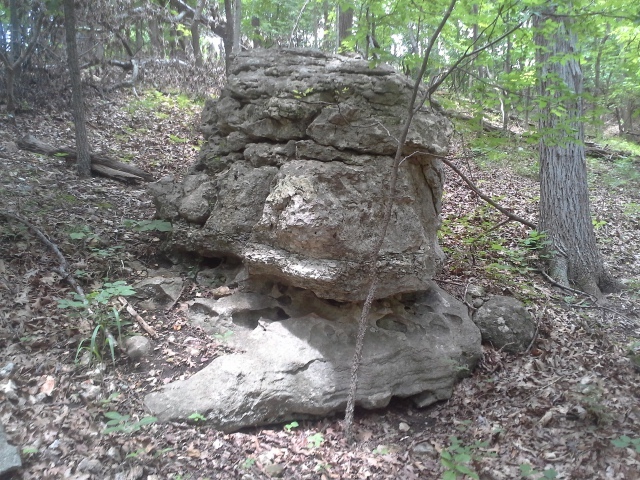 I have hiked through a lot of Greensfelder Park, and it was a different looking area than I was used to. Steep, open hillsides seemed to be the regular fare, leading into deeper and darker wet weather ravines. 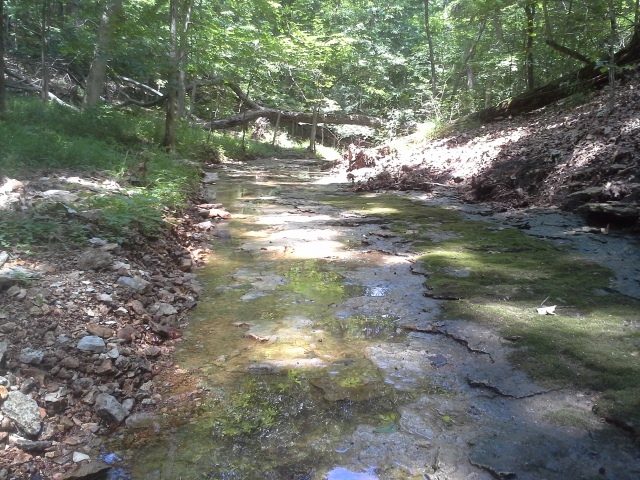 The creek along the final ravine floor was a neat little find. It is one that you end up having to cross a few times along the Eagle Valley Trail. It was kind of cool to see where it begins, and I can’t imagine how alive this area must be during and after a rain storm. Pretty scenic little secret. Along the course of this trail, Max and I saw four deer in different spots. Three of them were fawns! I think this directly speaks to the isolation and lack of traffic that this trail must get. If you are looking for the steepest trail in Greensfelder, this is it. Severe descents and leg burning climbs. There were sections that could probably use a couple of switchbacks, but they were nowhere to be found. Get ready for a workout. The parking for this trail is very lacking, and you will most likely have to park back by the bathroom/picnic area, and walk an 8th of a mile or so to the trailhead. The sign at the trailhead says that it is 1.3 miles. The online map says that it is 1.7 miles. Even though we were a little less energetic from the earlier trails that day, Max and I agreed that it was the longer of the two distances. 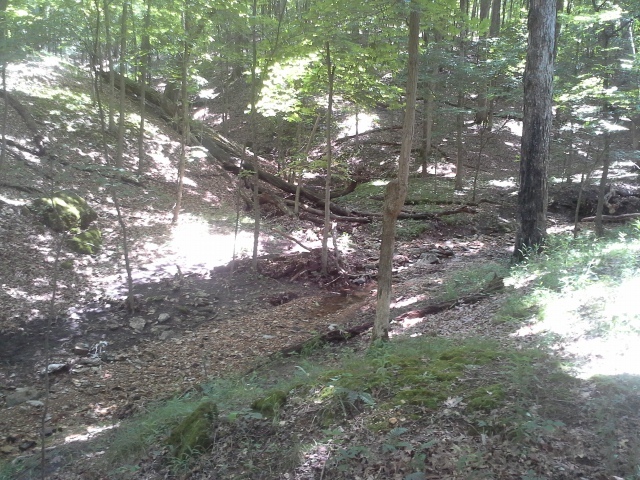 It really is a neat trail, with a different feel to it than the other trails in Greensfelder. A little darker, a little steeper, a little more wild, and a good workout all around. I had never hiked it before, and I was glad I did. It seemed to contain what I would describe as some of the more secretive and special little areas of the park, down there at the bottom of the ravine along the creek. I hiked the Mustang Trail today after starting on The Eagle Valley Trail after not hiking it for the past five years. I had a grandson born who’s now five and I was enjoying him. 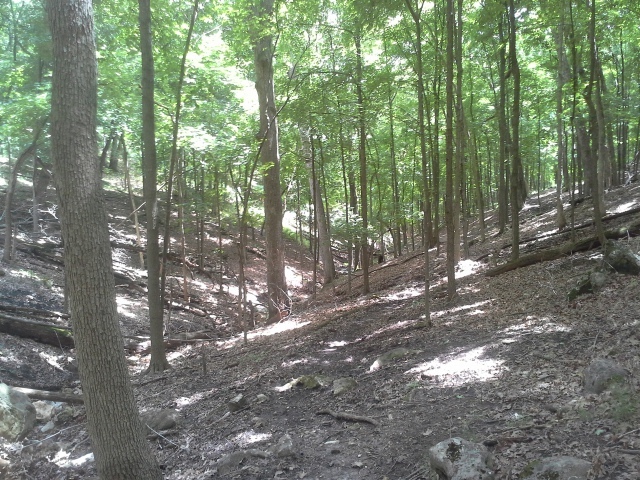 This is the most rugged,wildest trail in the park with steep climbs….i found myself full of ticks afterwards.